Irides is an amalgamation of soundwalks, listening experiences as well as experiences of smell, vision, touch and taste. It is based on different environmental recordings I made, mostly – but not always – on the same theme, and on memories connected to the places that appear in the recordings. “Irides” literally means rainbows. In Greco-Roman mythology, rainbows were thought to be bridges made by goddess Iris, and connected heaven and earth. Irides are multicoloured arcs caused by diffraction and dispersion of light by water droplets in the air. Similarly, in this composition, momentary sunny spells and droplets of rain give rise to spectra, bands of colours, arcs that form double, triple and multiple sonic rainbows that permeate the scenery of the piece. The composition explores the relocation of the visual, gustatory, olfactory, and haptic environments into the aural space. It also examines interrelationships between music, time perception, memory and the listening environment. 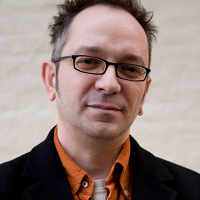 Aki Pasoulas is an electroacoustic composer, whose works are continually performed worldwide. He holds a PhD on timescale perception in electroacoustic music, and between 2004 and 2012 he taught at universities in London including City, Middlesex, and the University of the Arts. His doctoral research, supervised by Denis Smalley at City University London and funded by the AHRC, investigated the listener’s experience and interpretation of time passing and the interrelationships among timescales in electroacoustic music. He is a board member of the UK and Ireland Soundscape Community (UKISC). He originally studied and worked as a graphic designer, before embarking on music studies at the Open University and then at Goldsmiths College, University of London, from where he graduated with first class honours. His BMus concentrated on contemporary art music, composition and ethnomusicology. He subsequently gained a distinction for his master’s degree at Goldsmiths, specialising in electroacoustics. Aki organised and performed with many ensembles and wrote pieces for various combinations of instruments, found objects, voice, recorded and electronic sound. Aki was a SPNM shortlisted composer for 2008-11. His compositions received honorable mentions and were shortlisted at international composition competitions such as Métamorphoses 2008 in Belgium, and Concours Internationaux 2009 (Musiques Electroacoustiques et Arts Electroniques) in France. His works have been selected and presented at key peer-reviewed events across the globe, and his music is housed in the Phonothèque and Mnémothèque of the Institut International de Musique Electroacoustique de Bourges (IMEB) in the National Library of France. Nympholepsy is inspired by the myth of the nymphs Ithome and Neda who were looking after Zeus at Clepsydra spring, near ancient Messene in southern Greece. According to Greek mythology, the Nymphs were mortal deities that personified the sacredness of nature. Nympholepsy explores the blurred limits between myth and history and examines the relationship between deities and human beings, nature and the supernatural, as well the ways in which these relationships can influence our understanding of and connection with our environment. Nympholepsy is employing field recording, electroacoustic composition and acousmatic performance to link the archaic with the contemporary by establishing a dialogue between the ethereal (sound) and the material (the performance space). The sonic material of the work is based on the voice of singer Savina Yannatou which is manipulated and combined with environmental recordings. Through the collective gathering for an acousmatic performance and the personal activity of listening, Nympholepsy will link the human and embodied world to the divine and the invisible. The performance will invite the audience to an immersive listening experience, an empirical interaction with immersive sound that will transform the perception of the identity of the performance space. Nympholepsy will be a sonic construction of a space that is rooted physically in the performance space but is shaped and completed in the imagination of the listeners. NightEscapeexplores a night-time soundscape using a field recording as the source material. Crickets dominate this field recording. I find the sound of crickets extremely relaxing and calming and their presence reinforces the fact that I am somewhere else, exploring and travelling because their sound to me is somehow exotic. I have restricted myself to using one night-time recording, which facilitates the exploration of this recording in detail.NightEscapewas composed using a ring of 8 loudspeakers. The piece offers the listener time to immerse themselves in a meditative and calming soundscape, taking time out of busy schedules to pause, reflect and escape. This piece was composed at EMS, Stockholm, March 2018. 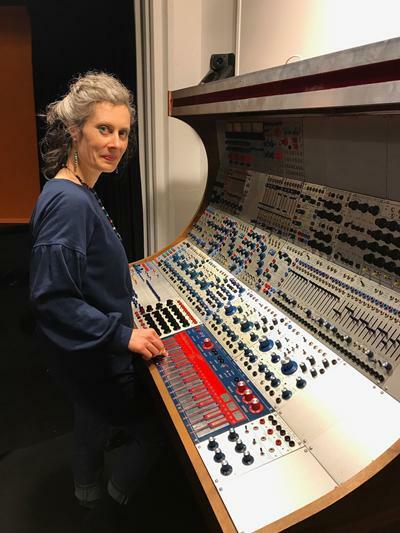 Brona Martin is an Electroacoustic composer and sound artist from Banagher, Co. Offaly, Ireland. Brona’s research interests include narrative in Electroacoustic music, soundscape composition, acoustic communication and spatialisation. Her research explores metaphorical and real-world representations of diverse soundworlds, images and experiences, where the aim is to reveal particular sonic characters that are not normally the focus of listening. Brona’s portfolio of works explore the layers and textures of sounds that contribute to the overall sonic-makeup of specific places both real and imaginary. Through listening, recording, analysing and processing, the layers of a soundworld are studied in great detail. Processing of these materials reveals the sonic qualities and the internal behaviour of specific sounds. Brona’s artistic portfolio offers an in depth and alternative listening perspective and experience where the complexity of everyday sounds are examined and rearranged into a new context. References are also made to the design of the acoustic environment where noise pollution often masks the more pleasant sounds of the natural environment. Brona Martin is currently a Teaching Fellow in Composition at the University of Southampton. It’s a Saturday, a summer’s evening at the eastern edge of England. It’s a small, seaside town with a sandy beach, a church, a fish and chip shop. There are people relaxing as the sun goes down: on the beach, in the pub, on the park benches. It’s the everyday, a summer evening life: sea watching and chatting, cliff walking and biking, children playing, church bells ringing – noisy gulls crying. A warm, convivial world. And, it is a sound-world that is rich in visual imagery – a cinema for the ears. This is an electroacoustic music composition that explores and sonically exploits an audio tableau to find new meanings, new musical resonances, as it dips into the reservoirs of musical discourse hidden underneath. Tom Williams is an award-winning electroacoustic music composer. His song cycle ‘Like Oranges’ received numerous international performances and broadcasts and was recorded on the Kitchenware label; ‘Ironwork’ for piano and tape was an ALEA III 1993 prizewinning work. His acousmatic work ‘Can’ won the Italian music medal ‘Città di Udine’ (2010) and ‘Shelter’ received a honourable mention at IMEB, Bourge, 2006. Recent works include composition for New York cellist Madeleine Shapiro cello with electronics, ‘Dart’, performances at New York, INTIME, ICMC2013, SEAMUS2014, NYCEMF2015 & a British Composer Awards nomination 2013, available on Albany Records. The acousmatic piece ‘Home (Breath Replaced)’ at MUSLAB2015 (Mexico City), ICMC2016 (Utrecht), Sonorities2016 (Belfast), NYCEMF2016 (New York) CMMR2016 (Sao Paulo), SEAMUS2018. Recent works include the song cycle ‘Meditations on a Landscape’ (performances at NYCEMF2017 & Sound+Environment 2017, Hull). April 2018 he was a featured composer at Sound Junction, Sheffield University. Sarah Watts commissioned and premiered his 2018 piece for contrabass clarinet and fixed media, ‘Weighed Down by Light’ at Sounds Agenda, Sheffield. Tom Williams studied music at Huddersfield and Keele Universities (UK) and completed a doctorate in composition at Boston University, Massachusetts. Currently he is an associate professor in composition at Coventry University, UK. Liz Greene is Senior Lecturer in Filmmaking at Liverpool John Moores University (England). Her research interests are in film sound, the audiovisual essay, and documentary film. She has published articles in a number of journals and edited collections and is the co-editor of The Palgrave Handbook of Sound Design and Music in Screen Media: Integrated Soundtracks (2016). She continues to work in the film and television industry, primarily as a location sound recordist. She is also currently directing a documentary film on the importance and significance of eyebrows in Liverpool. Elena Biserna is a researcher and occasional curator. Her interests are focused on listening and on contextual, time-based art practices in relationship with urban dynamics, socio-cultural processes and the everyday sphere. Her current research project explores the relationships between walking, listening and sound-making since the 60s. She has taught at the Aix-Marseille University, at ESAAix-École Supérieure d’Art d’Aix-en-Provence and at the Academy of fine art of Bologna. She gave talks at different institutions such as, recently, MAR-Museo d’Arte della città di Ravenna; INHA-Institute d’histoire de l’art, Paris; University of Lisbon; MACRO Testaccio, Rome; De Montfort University, Leicester; Gaîté Lyrique, Palais de Tokyo, EHESS, Paris. Her articles and interviews have appeared in several international publications (Les Presses du Réel, Mimesis, Le Mot et le Reste, Errant Bodies, Amsterdam University Press, etc.). As a curator, she worked with several organizations such as Locus Sonus (Aix-en-Provence), Sant’Andrea degli Amplificatori (Bologna), Cona Zavod (Ljubljana), Xing (Bologna), Saout Radio, Sound Threshold (London). Among her recent projects: Mobile Audio Fest (Locus Sonus, Aix-en-Provence-Marseille 2015, co-curated with Peter Sinclair) and the ongoing Walking from Scores. Among her recent publications: “‘Step by Step’. Reading and Re-writing Urban Space Through the Footstep,” The Journal of Sonic Studies 16 (2018); “SoundBorderscapes. Vers une écoute critique de la frontière,” antiAtlas Journal 2 (2017); “Mediated Listening Paths: Breaking the Auditory Bubble,” Audio Mobility, Wi: Journal of Mobile Media 9.2 (2015). To register, go to the Registration page and follow the instructions. Registration for early birds is available until 31 December 2018. Tom Williams is an electroacoustic music composer and principal lecturer in Composition at Coventry University. In 2010 his acousmatic piece Can won the Italian music medal ‘Città di Udine’ and Shelter received a honourable mention at IMEB, Bourge, 2006. Collaborations include: the dancer Vida Midgelow on two video works Voice (a Retracing) and Home (a Replacing); New York cellist Madeleine Shapiro on Dart for cello and electronics (available on Albany Records, New York) – the piece was nominated for the British Composer Awards 2013; with the American soprano Juliana Janes Yaffé for the song cycle, Meditations on a Landscape; with Sarah Watts for Weighed Down by Light for contrabass clarinet (2017/18). Recent performances have included ICMC2016 Utrecht; NYCEMF2016/17; Diffrazioni Festival Florence; CMMR Sao Paulo; Sounds Agenda 2018 Sheffield; Sonorities, Queens University; Sound + Environment, Hull, and MUSLAB in Mexico. 10 days left to submit your abstract to Mapping Spaces, Sounding Places conference!